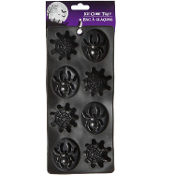 Halloween Gothic Haunted House Pirate Party Ice Cube Tray Jello Shots Mould Makes Ghoulish Party Decorations and Cheap Halloween Props. Terrific for SPIDERMAN themed birthday parties!!! Chill your favorite drinks and enjoy them -- cold to the bone! Easy to use, just fill the flexible silicone rubber tray with water or your favorite fruit juice, freeze, and voila - a fun way to cool your favorite drink. Then, pop them out and you will create an icy array of spider web shapes that will have everyone’s timbers shivering. For extra fun, try Jello bites or shots recipes for a cool confection, or try filling with melted chocolate for a sweet treat! Give your guests a little fright with spooky spiderweb ice cubes! Flexible and almost indestructible, these food-grade SBS plastic silicone ice cube trays can be reused over and over again. Be sure to grab extra, so you can freeze up a batch for your next party. Surprise your guests with spooky ice cubes! Tray form makes eight pieces of ice. Each individual mold form measures approx 1.5-inch (3.75cm) x 3/4-inch (1.88cm). *Helpful tip: Because the SBS plastic silicone is flexible, it will be easier to fill with water and place in the freezer if you put it onto a small baking sheet first. -Makes great costume party prizes!